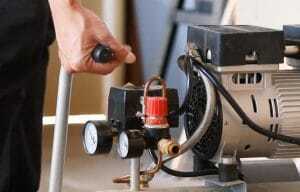 When you need to do a job in your garage, you should consider an air compressor. These tools are very versatile because they can be used for a variety of purposes, which include powering airbrushes, inflating tires, or even powering a pneumatic tool like a nail gun. 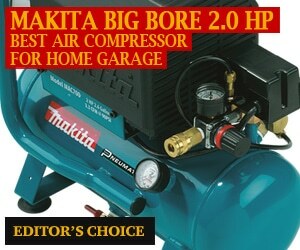 The best air compressor for your home garage can even help you operate a variety of air tools simultaneously. In this guide, you’ll be able to find five unique models of air compressor that are some of the best on the market. 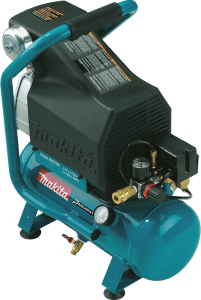 Makita is a manufacturer that is well-known for its professional-grade tools, and this device has a great flow rate and a good amount of power for just about any application. It has a 1,720 RPM pump and an impressive cubic feet per minute flow rate of 3.3. The product also has a low amp draw, which means that there’s less of a chance of power failure. One of the biggest drawbacks of this device is its heavy frame – at 52 pounds, you may struggle to move it around the work area. The packaging is a bit flimsy, so it’s possible to have damage to the product when shipped. When it comes to features, the Makita MAC700 is well-stocked. Considering that conversation occurs in the 80-decibel range, the fact that this product has an 80-decibel output is impressive. It also has a two-horsepower output, which is very impressive, especially at the current price point. As with many other Makita devices, the MAC700 is a good workhorse air compressor that has the extra oomph that you need for productivity. Not only does it have a two-horsepower operation, but it also has a good flow rate that can support multiple air tools. DeWalt’s pancake air compressor is impressive due to its DeWalt-style durability and job-readiness. This product packs in a 165 maximum psi and has a six-gallon tank. The company also manufactured this product to start up easy, even in colder climates. The device is also designed with portability in mind; it only weighs about 30 pounds, so moving it to and fro shouldn’t be much of an issue. It even has a heavy-duty handle at the top that attaches to the pump. The product is very well made, but there are still leaky fittings on the air compressor that can be very annoying. Additionally, the pressure regulation can leave much to be desired; it has a tendency to deplete during long jobs, which could be a result of the fittings not being attached as firmly as they could be. While it isn’t whisper-quiet, using this device is fairly low-noise. In fact, during operation at its highest setting, you can expect this air compressor to output noise levels that are around 75.5 decibels, which is fairly low. 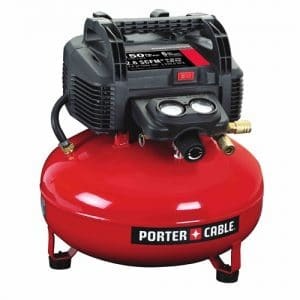 Additionally, the low weight of this product makes it ideal for anyone that needs to move around a larger area such as those that need a compressor for repairing fixtures around a ranch. 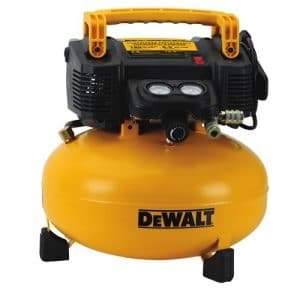 As with many DeWalt tools, this air compressor is designed to work hard and last for the long haul. That being said, leaky fittings can be a hassle, but overall, you can expect good things from the DWFP55126. If you need to go from job to job or you need a compressor to take with you to your t-shirt airbrushing business, then you’ll need portability. This product, which comes from California Air Tools, is a great product for portability because it has two wheels that make this an easy to transport device. It also has a fairly impressive operation as well; it has a 3.00 CFM functionality at 40 psi, and it even has a maximum 120 psi output. 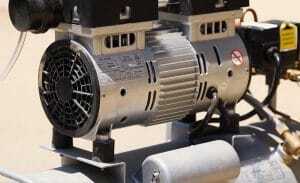 When you use the full output of 120 psi, the motor can drop down to as low as 90 psi at random intervals. The air filter also isn’t placed on the device very firmly, so it can break off if you’re not careful. This is a slight problem for several components because this product doesn’t have a roll cage. If you are working in an environment where you don’t want to disturb others, this device stands out because it only has a 60-decibel sound output. Coupled with the fact that it has wheels and a very easy to transport design, this is a good unit to take with you out into the world when you need to do work with air tools. With a portable design and a very low-volume output, this product from California Air Tools is very impressive. It has a good flow rate and a high psi output that also makes it a good workhorse tool for multiple uses around the garage and outside in the field. As a pancake air compressor, this Porter-Cable is designed to be taken around the work area with a modicum of ease. 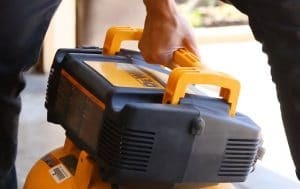 In many aspects, this product is very similar to the DeWalt model – it has a pancake design, has a 120-volt motor, and has a six-gallon capacity. Outside of this, the product also has a firm footing that keeps it stable when you’re working in various conditions – it even has a maximum CFM of 2.6. One of the biggest issues with this device is its noise output; even at lower settings, you can expect 90-decibel sound levels. At maximum output, this jumps up to around 101 decibels, so this isn’t the device to be used in places where you might disturb others. This is also a tool that vibrates a lot, which means that under some circumstances, it can move. This air compressor has a maximum psi of 150, which means that you can get a lot of pressure out of this tool. 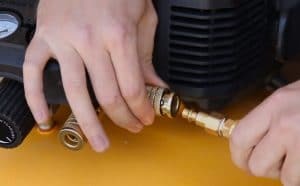 The air compressor also only weighs 30 pounds, which makes it a good option for easy and quick portability. It also comes with 13 accessories, which means that you won’t have to purchase these components yourself. For those in need of portability and power, the Porter-Cable C2002 is a great, mobile option that is also fairly stable on most surfaces. It is also very durable, and the components are easy to adjust when you need more or less pressure. Overall, this is a great tool for most uses. 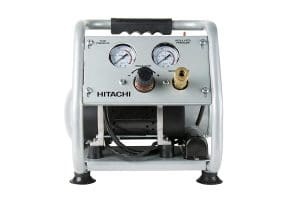 This Hitachi air compressor has the quietest operation of any of the devices in this guide. Even at maximum output, this air compressor almost never exceeds 59 decibels of sound. Additionally, the tool only weighs a little more than 25 pounds, so transport will be easy and quick, especially with the ergonomic handle at the top. Sometimes, the device can struggle to achieve a higher level of pressure, and sometimes, the pressure indicator can fail to display correctly. Also, the tool can sometimes ship with a faulty regulator that needs to be repaired. This air compressor stands out because it has a roll cage, which will protect it in the most active of work spaces. As a result, this device can be dinged around a bit without you worrying about a damaged shroud or disconnected components. At its base, you’ll find four feet with suction cups, which means that this is a great option for stability. With its roll cage and firm footing, this is a good air compressor for those that need reliability and longevity. While it can have pressure-related issues, the 125 psi output and overall durability make this a good choice for an air compressor. 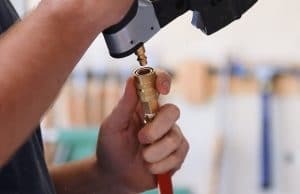 Now that you’re looking for a new air compressor, you’ll most likely be wondering what features are best for home garage use. For the most part, for those looking for performance, horsepower is going to be the defining feature to consider when you’re making a new purchase. As a general rule, don’t go under 1.5 horsepower when you’re purchasing a device of this type, and of course, the more horsepower, the better. For example, on the market, it’s possible to find air compressors that exceed 6.5 horsepower, but you can expect these to get pricier as the HP increases. Additionally, flow rates are also a consideration that is affected by horsepower – this feature allows for the compressor’s motor to more efficiently provide power to the compressor. Wheelbarrow – As the name indicates, this style of air compressor is designed to have a bit of mobility. In many cases, the wheelbarrow compressor comes with two tanks that are mounted together and have a frame that sports one or two wheels. When they are in use, these air compressors lay down to a prone position, and most have legs at their rear that provide extensive stability. If you are an airbrush user that wants to take their compressor with them for different applications, this is the way to go because the wheels offer a lot of conveniences. Hot Dog – In most situations, these types of compressors only look slightly like actual hot dogs, but they are named this way due to their cylindrical design. These can be very mobile because some of the hot dog-style compressors even include two wheels so that there’s extra portability. Like the wheelbarrow compressors, hot dog compressors lay down on four legs and are known for their workhorse style of output. There are two types of air compressor designs when it comes to power: electric- and gasoline-powered. 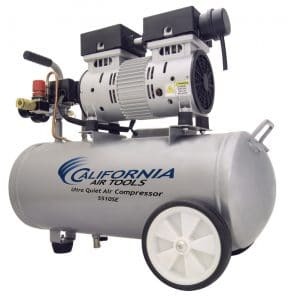 The electric models are the most popular style of air compressor, but gasoline compressors have their uses. 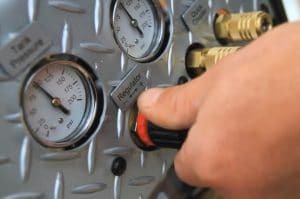 As a general rule, electric compressors are more popular because they can be used in an enclosed garage, they are much quieter, and can simply be plugged into your homes power supply. Gas-powered models, on the other hand, are advantageous because they are cordless, can be used in damp areas, and have a higher horsepower. Electric compressors typically run on 110-volt systems, but there are larger models that need to run on 240-volt outlets. Also known as CFM, the cubic feet per minute of your air compressor is essential to its overall performance. CFM affects the aforementioned flow rates, and this feature is known to change dependent on the psi of the device that you have hooked up to the compressor. For this reason, when you’re purchasing a compressor, you’ll want to know the CFM requirements of your air tools so that you can be sure that it’s compatible with your compressor. With a high enough CFM, you’ll even be able to run multiple air tools concurrently. When you’re working in a garage, you don’t always have a lot of space, and some compressor models are simply massive. For this reason, you’ll always want to consider the sizing of your compressor before you make a decision. If you have very little space, then purchasing a pancake compressor can be useful – these compressors aren’t super heavy, and they can be moved around the work area when needed. On the other hand, if you don’t have a lot of horizontal space, then a device like a twin or stand-up single tank compressor can be more suitable for your needs. These compressors can be stowed away in a corner area and won’t take up much space. If you’re going to be moving around a lot with the compressor, to save the constant lifting, you can also purchase one that has wheels. 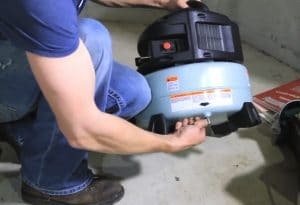 As you might expect, wheels make moving the compressor around your garage or even down the street much easier, and most lay down so that you won’t be losing stability for portability. A Roll Cage – If your garage typically has a lot of moving parts and semi-hazardous conditions where a device can become damaged, then a roll cage can help prevent punctures in your air compressor and can keep the mechanical components protected. A good air compressor can be one of the best investments for an individual that wants to do various jobs around the house. In the future, the electric air compressor is becoming increasingly popular, and as a result, there are several great features that are becoming more common. For example, there are wireless models on the market that you can charge, which can increase their range and portability. 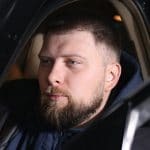 These tools will continuously evolve, and perhaps the battery capacity will even extend operation so that you’ll be able to use these products for several hours between charging sessions.